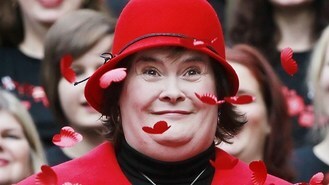 Susan Boyle has officially launched this year's Scottish Poppy Appeal. The singing star, dressed for the occasion in a long red coat and matching hat, took to the steps outside Glasgow Royal Concert Hall to declare the appeal open. She said she is "very proud" to help because her father Patrick served in the Second World War. The event was kicked off with a performance from 80 members of the West of Scotland and Edinburgh Garrison Military Wives Choirs, who sang M People's Proud and Sing which was performed by Gary Barlow, the Commonwealth Band and the Military Wives Choir at the Queen's Diamond Jubilee Concert in June. Susan, from Blackburn in West Lothian, posed for pictures with the choir members who showered her in little red poppies. The 51-year-old, who shot to fame on Britain's Got Talent when she auditioned with the song I Dreamed A Dream from Les Miserables in 2009, also signed autographs and had pictures taken with fans. Around five million poppies and 8,000 wreaths are hand-assembled by 40 veterans with disabilities every year at Lady Haig's Poppy Factory in Edinburgh. They are distributed across Scotland by around 10,000 volunteers. Poppyscotland, the charity which runs the appeal, uses all money raised to support ex-service members and their families who struggle with physical, psychological or financial problems. Poppy Week this year is November 5-11. Muse frontman Matt Bellamy has revealed his 15-month-old son looks set to follow in his footsteps. Madonna gave fans a fright when she took a tumble on stage during one of her shows. Avril Lavigne has reportedly covered one of her fiance's songs for a film soundtrack. Jennifer Lopez has suffered yet another wardrobe malfunction on stage. Lady Gaga has confirmed that she will not be releasing her new single until 2013. Rizzle Kicks star Jordan Stephens reckons X Factor rejects MK1 will still go far. Singers Alesha Dixon and Pixie Lott are to perform at a concert launching the Royal British Legion Poppy Appeal. New father Robbie Williams has revealed he has taken charge of changing duties with baby Teddy - and says dealing with nappies is great bonding experience. Carly Rae Jepsen has said supporting Justin Bieber on tour allows her to live out her dream every night.